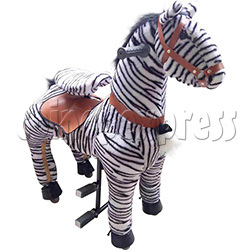 Mechanical Horse Walking Animal (Medium Rider) is a cute type and middle size rocking animal for kids or adults. Variety of style kid riding horse toy on wheels for option, stuffed with different plush, is a fitness and entertainment game which vivid modeling and realistic action, kids ride on it and bounce up and down, the walking horse will go forward, left and right, to use mechanical action to move the horse forward, it will be a rocking fun and ride on horse for kids, the moving controlling is very simple to play just coordinate body and arm movements, is suitable for children over 3 years old to play. Mechanical Walking Horse rides on wheels, which can provide a little variation, when players ride on, it feel just like riding on a real horse. It is high quality plush made and different colors and fur for option. - Players enjoy the pleasure of riding the horse.